Globe & Mail, May 5, 2016 – Toronto’s official guidelines for new mid-rise developments are humane, well-intentioned and quite specific. Their specificity is one reason they are also controversial, at least in architecturally interested circles. Designers and developers complain that the gate-keepers at city hall frequently interpret the guidelines in a fundamentalist fashion, thwarting artistic innovation and encouraging a certain dull sameness in mid-rise schemes. If the planners are indeed hide-bound grinches when it comes to enforcing the guidelines, they fell asleep at the switch on at least two recent occasions. 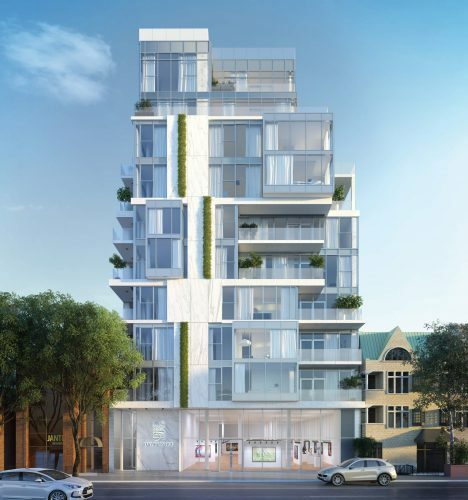 One was the day architect Stephen Teeple brought forward his final plans for the 146-unit condo project called SIX25BV, in Bayview Village. And the other was when Roland Rom Colthoff (principal in RAW Design) proposed the small residential complex scheduled to go up at 346 Davenport Rd., a few steps west of Avenue Road. Both mid-rise designs have swing and smooth style, and there’s not much letter-of-the-law about either of them. The city’s rules mandate step-backs above the lower storeys of mid-rises, to guarantee plenty of sunlight on the street and to mitigate the weightiness of the building over the sidewalk. To be sure, the upper levels of the structure that Mr. Teeple and project architect Bernard Jin have crafted for Haven Developments retreat from the property line in stages, giving the bulk of SIX25BV the step-ladder form that the city considers desirable. The differing sizes of the floor plates suggested no fewer than 65 variations on apartment layouts, Mr. Teeple and Mr. Jin said. The suites range in area from 450 to 1,350 square feet, and in format from one-bedroom to two-bedrooms plus den. According to the plans I saw, the units seem to be about as compact as any high-efficiency condominium apartments you might find downtown, although terraces and balconies appear more ample than the ordinary. One two-bedroom suite with an interior of 984 square feet, for example, opens through glass walls onto a wrap-around terrace 554 square feet in area. Prices at SIX25BV start in the mid-$200,000s. By way of contrast, the least expensive unit (1,000 square feet) at Roland Rom Colthoff’s very downtown, 10-storey 346 Davenport is on the market for $800,000. The average price for one of the 30 suites available, Peter Freed (head of Freed Developments) said, is in the $1.2-million to $1.5-million range. Because some buyers are acquiring more than one unit and combining their holdings, the final number of homes in the building may turn out to be around 20, he added. “This is not a starter home,” the developer said. There will be private parking and a concierge and one upscale commercial space on the ground floor, but no gym and definitely no party room. “Peaceful living and privacy,” according to Mr. Freed, will be the chief amenities accessible to residents. But, if renderings can be believed, the dwellers in 346 Davenport will also enjoy living in a structure with elegance and attractive attitude. The streetside façade of Mr. Rom Colthoff’s tall, trim building is an interesting, quietly irregular abstract composition of glassy boxes and recessions arrayed as tree branches on either side of a irregularly snipped “trunk” of white material. (Mr. Freed said he had hoped the vertical strip would be richly veined white marble, but admitted that Toronto’s climate is probably too hostile to this classic stone to make its use viable.) The façade geometry expresses each suite individually, creating distinct “addresses” on the exterior for each home-owner. Both SIX25BV and 346 Davenport are examples of the imaginative mid-rise things that can happen when architects treat the city’s sensible design guidelines with respect, but push back a little on their interpretation as holy writ.